I totally love this pattern and enjoyed every minute of the knitting. This was my first time cabling, and they just came out beautifully. 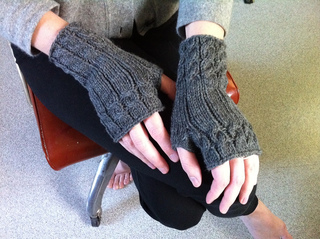 I first came across Fetching in brooklyntweed’s project list, and I’m glad I did because they both look and fit better with that extra repeat of the cable rows at the knuckles. I figured I might want to make a lot of these, so I approached this first pair as something of a trial, thinking they probably wouldn’t come out exactly right, but they did. I used Cascade 220, which is great to work with but made for mitts a bit on the dense and stiff side, even after steaming. 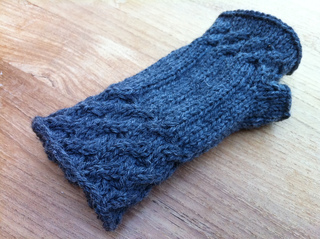 They also fit me, which means any I make for anyone else will be done with a lighter yarn and/or smaller needles. Nichole wound up being the lucky recipient of this pair. These were done on #7 DPNs with the fifth needle as the cable needle. I picked up an extra stitch in each thumb gutter (3 per side instead of 2) then decreased as I worked around; added the extra repeat, as noted; and also did a standard bind-off instead of the picot bind-off. Definitely making them again (and again)!